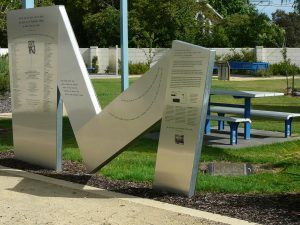 The Mary MacKillop Stable School Park is situated on the corner of Queen and Bowden Streets, Penola, South Australia. 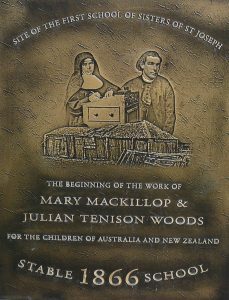 It is the site of the first school begun by Mary MacKillop in 1866 after she and Father Julian Edmund Tenison Woods realised their dream of providing Catholic Education for poor children in remote, isolated areas. Within months of this beginning, the rented stable was deemed unsuitable for a permanent school. Father Woods commissioned the building of a new school-room near the Catholic Church in Portland Street, Penola. After the Sisters and children had left the rented stable to occupy the new schoolhouse, the MacDonald family took possession of the stable site once more. They dismantled the building and took most of the timber to their place at nearby Kalangadoo. By 1925, the block had been cleared. On December 23 of that year, William MacDonald’s great grand-daughter, Euphemia Ruth Willshire, sold the land to the Sisters of Saint Joseph. For the next fifty years the site was used by the locals for grazing their animals. For many years the site of the stable school had been a public memorial garden with a plaque commemorating the founding of the Sisters. With the excitement and joy experienced by so many Australians at the time of Mary MacKillop’s canonisation in 2010, the Sisters of Saint Joseph decided to redevelop the stable site into a place of reflection and prayer. On October 28, 2012 the Mary MacKillop Stable School Park was officially opened and the Stage 1 development blessed. Stage 2 was completed in 2014 and blessed on June 29, 2014. An audio presentation written and spoken by historian Sister Marie Foale rsj is a feature in the Park. It describes the history of the site and invites visitors to imagine the first few months of a child attending the Stable School. This popular Mary MacKillop Stable School Park is visited by many pilgrims and tourists each year.